While there are many arguments and contradictions on whether or not Rivers State complied with the sit-at-home protest ordered by IPOB in the entire Biafra Land, it is common knowledge however that it was successful here in Rivers State. But as an eye witness reporter, I shall by this article bring to you the level of compliance as it happened in Rivers State Igweocha province Biafra Land. Despite deceit from many quarters, especially Nigeria media, the Ogoni people also observed the sit-at-home as the ever busy Bodor-Boni Waterways was completely deserted, speed boats, canoe and other means of transportation on the water ways were seen anchored at waterside. Tank Junction is one the busiest areas in Port Harcourt when it comes to business and circular activities due it centrality in connecting Rumuokoro, Eleme and Iguruta, however on May 30th Biafra heroes day; shops, plazas, building materials market were seen shut down in the area because Biafrans were mourning their own who paid the ultimate price for their freedom. It was a great surprise as there was total lock down of shops, petrol filling stations, businesses, markets, schools, banks and transport activities. The Rumuodara Artillery road which is normally plagued with Keke Napep (tricycle) and mini buses was completely deserted. Only few people were seen clustering around a newspaper stand as the road automatically became a football field. My greatest surprise was when I saw the almighty callus Millar phone shop in Artillery completely shut down as a silence grieved area. However, there were police men hanging around the junction with their AK47 seeking whom to devour but unfortunately for them they found none. It was an overwhelming experience on May 30th sit-at-home in old ABA road in Port Harcourt. Old Aba road is one most traffic congested area in Port Harcourt, being a place where Shell IA, Paboard Brewery, Halliburton oil services, Schlumberger, Coca-Cola and other multinationals are domiciled. However, it was amazing to me and indeed to Nigerian state, that the ever-busy old Aba road was completely deserted. 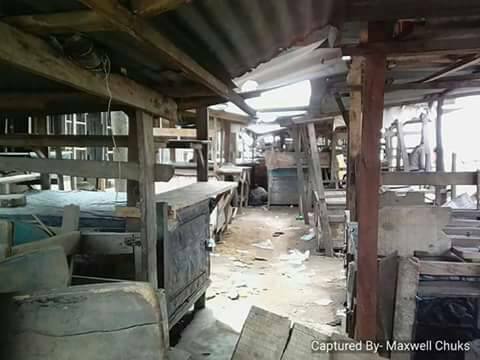 Rumuobiokani building material market totally shut down, and shops, schools, companies and transporters all went on a compulsory holiday. Only birds sang and wag their tales on the road. Those that are conversant with the Mile 3 markets can attest to how busy these areas can be on a normal day. It is a place where you find motor parts dealers, caterpillar dealers, building material merchants, in fact it is commonly said that the only thing you cannot find to buy in Ikoku is a human head. But to my greatest amazement these places were completely shut down. From Olu Obasanjo road to Mile 3, Rivers State University road and Mile 2 Diobo axis; roads were completely deserted as youths play football in the midst. When people begin to forfeit their daily bread for a particular purpose then you know the gravity and seriousness of their quest for freedom. OIL MIL MARKET, ELEME JUNCTION TO OYIGBO, KOM-KOM AND AFAM ROAD. Oil mill a weekly Market, which its busiest day is on Wednesday every week. On this day people usually choke themselves for want of space in the market, thus all over Port Harcourt people from different places including neighbouring state come either to buy or to sell their products in the market. 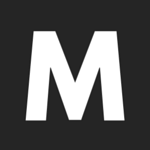 Consequently, there are always serious traffic jam in the area, that is always almost impossible to pass through, thus motorist look for alternative route to reach their destinations. 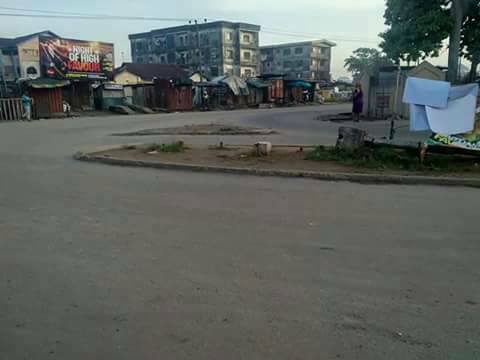 But on May 30th being a Wednesday, the road was free and the market very scanty as Biafrans sat at home to mourn their fallen heroes. Only few Yorubas and Hausas were seen hawking in the market. Oyigbo is one of the busiest area as far as Port Harcourt is concerned. This place can be regarded as a world of its own as it is a mixture of both city life and rural activities. Heaven knows this, one would have thought they may not be well informed about the sit-at-home order. But to my greatest surprise, Oyigbo was completely deserted and as quiet as a grave yard. Furthermore, on a usual day going from Eleme Junction to Oyigbo Express can take nothing less than 2 hours for traffic jam but on the said day it was as empty as the sky. All roads within the area was completely deserted, as schools, banks, building material markets, shops and other businesses were completely locked down. Motor cycle riders (Okada) and Keke Napep (tricycle) were not left out as they seem to have disappeared into the thin air as movement of persons was completely put on hold. Space won't let me to talk of Rumuokoro, Iloabuchi, Marine Base, Mile 1 Diobo, Lagos Park, Ogbuna-abali, Elelenwo and many other areas. But with all these massive compliance to the sit-at-home order by IPOB, can anyone still say Rivers State is not part of Biafra? I doubt. Finally, the sit-at-home order was a successful one in Rivers State and a proof it is Biafra Land.